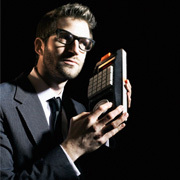 Deru is Benjamin Wynn, an electronic musician from Los Angeles. His compositions find hip-hop and electronic music linking hands, while dipping more than a toe in the ambient and classical pools. Previous releases on Ghostly International, Merck, Neo Ouija and more have allowed him to cultivate a dedicated following. An accomplished sound designer and film-scorer, he has been nominated for the MPSE’s Golden Reel Award and written works for the Paris Opera Ballet Company. Deru's appreciation of art and architecture runs as deep as the basslines that support his thoughtfully constructed songs. With one eye on music technology innovations, one ear tuned to the strains of his musical forefathers and every remaining molecule dedicated to producing synthetic symphonies, Deru is a creative force to be reckoned with. 2011-07 Deru Unveils Video For "Fadeaway"